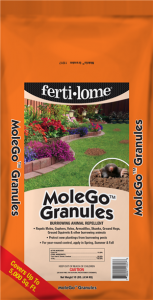 Home Garden Solutions Garden Center Moles….a lawn’s nightmare! As winter passes and we marched toward spring, the snow quickly melted from our landscapes. And what to our surprise are all these miniature pathways that appear in our lawn? It looks like a racetrack! Have little elves spent the winter tunneling beneath the surface? Well no, we have moles. Moles are small mammals up to 6 inches in length. They have cylindrical bodies, a long pointed snout, small rear appendages, large, strong front paws just made for digging, little eyes (just used to detect light and darkness), and a short stout tail (used to detect obstacles when backing through a tunnel). They are solitary mammals, male and female only coming together to breed. There can be fierce battles when two males meet and compete for the same territory. As breeding season approaches, the male burrows through foreign territory in search of a female, and emitting a high pitch screech. The breeding season starts in February and can last until May, litters of 2 to 5 young born in March or April. The young remain with the adults for approximately 30 days before they move off and find their own territories. Moles create a variety of tunnels that are used for different purposes. Moles typically build their dens deep beneath sidewalks, patios, sheds, any solid structure. They build a series of deeper tunnels used as living space and of course, the ones we are most aware of, feeding tunnels. It is believed that these surface tunnels are built as traps so that when an earthworm drops into one the mole can sense its presence and quickly dispatch to the site. Their saliva contains a toxin that can paralyze its prey for eating at a later date. While moles do not feed on plant material, their activity, tunnels and hills, kill off turf and other planted areas of the garden. We have created the perfect environment for moles, no pesky root systems to hinder tunneling and a healthy lawn just teeming with life: insects, grubs and earthworms. Most believe if you control the grub population you have controlled your moles. But in reality, the moles preferred food is the earthworm. There are various methods used to control moles: traps, poisons, smoke bombs, and repellents. Most work if the directions are followed correctly. So it really depends on your preference. Stop in and talk to our professionals on which is best for you! Here at Beisswenger’s, we see a lot of repellents used, the most popular being a granular castor oil. The key to success lies in the watering and the frequency of application. Castor oil needs to be applied once during spring, summer and the fall to remain effective. Once applied it needs water….and lots of it! So water, water, water, hope for rain, and water again. Being an oil based product, it moves slowly down through the soil.